There I was, sitting on a rock at the stables, letting the horse I'd just showered dry and graze in the sun, and I looked down and found a HUGE patch of sheep sorrel! Yum! I picked a big bunch of sheep sorrel and about a cup, maybe a little less, of lamb's quarters leaves. I grabbed a sprig of what I thought was thyme but turned out to be oregano, so I ended up not using it. I followed the recipe otherwise exactly and created a yummy soup which I will take in a thermos to work tonight. I've been keeping my eyes out for a chicken mushroom ever since I realized they are edible. Yesterday, on a walk with some friends, one presented itself. To be fair, my friend saw it first. It was way off the path and I was willing to walk through the poison ivy to get to it. It's a huge one and I only took a little bit. Since I was working overnight last night I felt that perhaps I should wait until after my shift to try a taste, since it has been known to make lips swell and people feel ill. 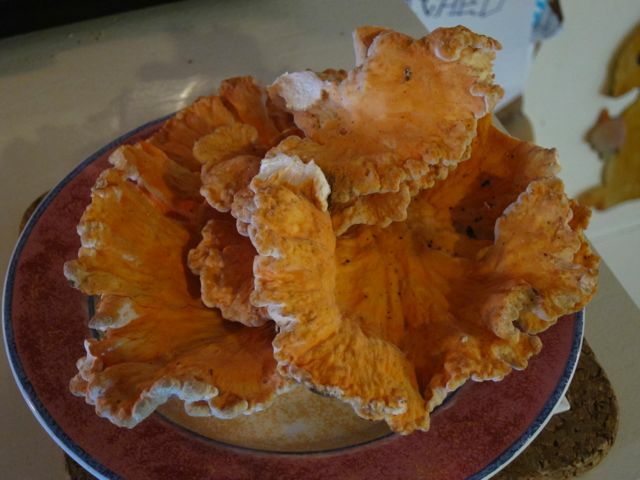 I confirmed that I had laetiporus cincinnatus, it was growing at the base of an oak tree and, according to the books, there really isn't anything else that looks like it. I also brought home some boletes which turned out to be a large Frost's bolete and a couple of others which were equally non-edible, and some milk caps which may or may not have been edible but I wasn't about to try it. I just got home a few minutes ago, broke off a bit and fried it in oil with a little shallot. It sure does taste like chicken breast. Now, what to do with the rest of it? The recipe had said it would be ready in 3-6 days, but it also said it should be kept at 68 degrees the whole time. That just wasn't possible in our house, so I figured it was a good bet that it'd be done by 3 days. I tasted it this morning and it was perfect. Even a little teeny bit crunchy. I washed off the jar, since a lot of the brine had flowed out during the fermentation, put the lid on and tucked it in the fridge. Now I can have it whenever I want! Tonight, I made ratatouille. It was fabulous. My husband felt the need to re-enact the facial expressions of the restaurant critic in Ratatouille, and when that first bite went into his mouth, he legitimately made that happy face. It was that good. 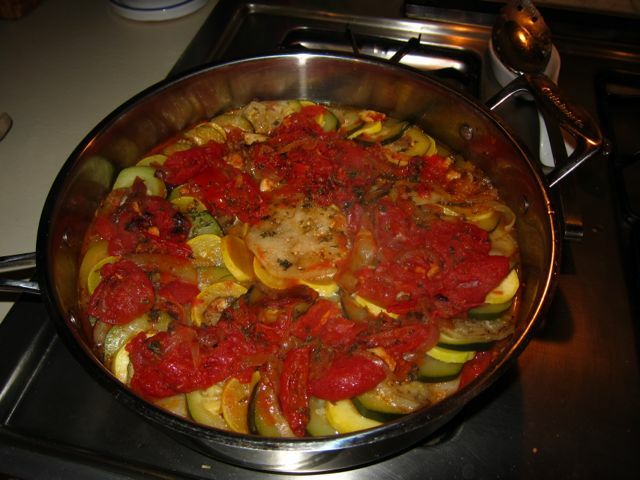 Overwhelmed by the veggies in the farm share, I used 2 summer squash, 2 zucchini, 3 eggplants, 3 onions, and all the plum tomatoes plus two from my garden to make it. I followed Julia Child's recipe with only a few modifications: leaving out the green peppers (used up in the pepper relish), frying the eggplant but not the squashes, and adding a can of tomatoes in thick puree because I needed more tomatoes. I even laid out the veggies one by one, like in the movie. This is one of those times when the vegetable dish looks as good as it tastes. Everyone who ate it had 2 helpings, and that includes my parents and the 10 year old. This morning I braved that Korean supermegamarket for the red pepper I needed to make my kimchi. I needed four things when I went in there: ginger, scallions, onions, and the red pepper powder. I came out with four bags of groceries, and considered myself lucky! 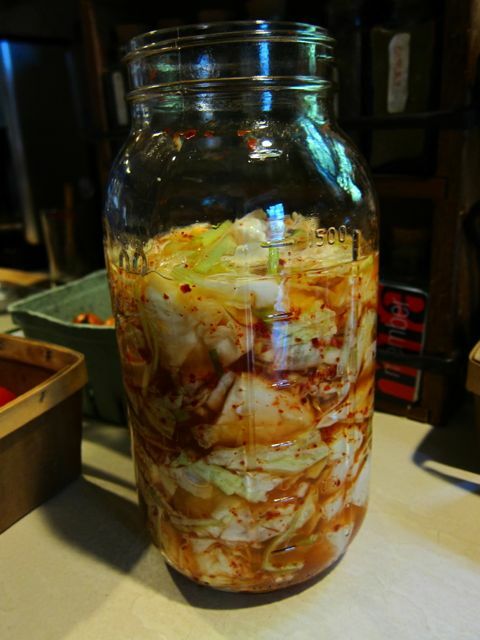 For the kimchi, the cabbage was soaked in a brine last night and drained today, reserving the brine. Then I mixed the cabbage with minced garlic, slivered scallions, a little sugar and salt, and the red pepper powder. This was packed into a half-gallon jar and the brine poured over it, with the rest of the brine in a bag stuffed in the top. Set aside to ferment, it claims it'll be ready in 3-6 days. This afternoon I got to work on all those peppers. I made a full batch of sweet pepper relish from The Complete Book of Small Batch Preserving, but used light green and dark green peppers rather than red and green. Sadly, when they cook the greens converge into one dull olive color, much less festive than the last batch. At the same time I made a half batch in which I threw all the hot peppers from the farm: jalapeños, one tiny poblano, and 5 long evil-looking peppers which I think might be Thai hot peppers. The final result is 3 pints of the sweet pepper relish and 3 cups of the spicy one, with 2 of those jars being the little 4 ounce ones which adds to my gift stash. This week I got the full farm share because my brother and his family are away. It's a little crazy how much food there is, and I didn't even get all the things in the fields! I came home with: a watermelon, a head of cabbage, 10 peppers, 3 eggplants, 4 summer squash, 2 pounds of potatoes, 5 onions, some kale, mustard greens, radishes, a head of red lettuce, 1 broccoli crown, 10 hot peppers, 1 pint of plum tomatoes, 1 pint of sungold cherry tomatoes, 1 striped german heirloom tomato, and a huge bunch of flowers (36 stems, I could have picked 60!). There were supposed to be tomatillos or husk cherries but they were both pretty picked out, and I skipped the herbs. The only disappointment was the watermelon, which wasn't ripe. It seemed ripe when I chose it. How does one know if it isn't? After getting everything home and washing it all, I started another batch of sauerkraut using the same recipe as before. I had 2 heads of cabbage (one from last week) totaling 6 pounds of cabbage. I picked the larger one to make the sauerkraut and I'll use the smaller one to make kimchi. Since I don't like caraway, I thought maybe I'd add some garlic to this batch so used the mandolin to slice 2 cloves of garlic paper-thin and added that to the cabbage and salt. Later tonight I'll start the kimchi and tomorrow the spices get mixed in. Since I seem to be up to my eyeballs in peppers, I will use the pepper relish recipe in The Complete Book of Small Batch Preserving and add the hot peppers, so it'll be spicy. I still have some of that sweet pepper relish left; this will be a nice contrast. Maybe I can do that tomorrow after dinner. I think I'll make eggplant parmesan and a big salad tomorrow night. Coming up soon are peaches (I'm finally waiting for the freestone kind) and raspberries which, like everything else this year, are early. Yesterday in the farm share there were lots of little beets. I always like to make pickled beets; usually I give half a batch to my mother-in-law since I know how much she likes them. Pickled beets and eggs are now always on the Thanksgiving table, an addition to the sides with which I grew up, thanks to her. So it's good to get those beets made every year. Before we went on vacation I'd gotten a few beets; they were large enough that they would have to be cut in half. But yesterday there was a whole basket of these little ones, about 1-2 inches in diameter, and it was part of the mix and match so I could take a lot. I got enough that, when added to the ones in the fridge, I was able to make 3 quarts of pickled beets. If you're using The Ball Complete Book of Home Preserving, just know that you need to double the liquid in the recipe. I never have enough! The other glitch was that I had to leave the house by a certain time, so I had to turn the canner off and run out the door and hope for the best. It all seems to have worked out fine. Two weeks ago I brought home 2 heads of cabbage from the farm share. I had been thinking about trying to make sauerkraut and, if it worked, I might try kimchee in the future. (I love kimchee. It's probably my favorite part of Korean cuisine.) But fermentation always seemed a little scary to me. I know, I made fermented pickles before, and beer, but still it is intimidating. This, however, went off without a hitch. I used the recipe for "Wine Kraut" in The Joy of Pickling and a total of 3 pounds of cabbage. I also left out the caraway seeds since I don't like them. The entire recipe, therefore, was cabbage, salt, and white wine. And it's been just doing its thing for 2 weeks, with no issues about scum or mold or any of the other potential pitfalls. Halfway through the fermentation process, a Russian friend had a taste and proclaimed it very good. That's reassuring, he has experience with fermenting food and knows what he's talking about. He noted that basically, it's just a way of dealing with your food going bad, as in, "It's... fermented! Yeah, that's it. It's still good." Today I processed it in the boiling water canner: 6 half-pint jars for 20 minutes and then I let them rest for 5 in the canner before I removed them. There was a little leftover which I had for a snack. I've never been much of a fan of store-bought sauerkraut. This was light-years away. Fabulous! 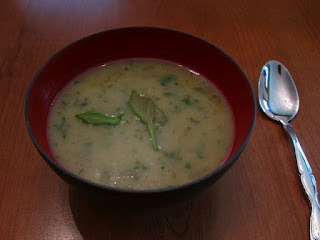 Now that I had 15 green tomatoes from the farm share, what was I to do with them? I still have piccalilli and green tomato chutney from the last time and, while I like the green tomato chutney a lot, I just don't use that much chutney. But there was this other recipe for green tomato ketchup and it seemed interesting and easy. Well, easy is a relative term. The steps were simple enough, but labor intensive. And I made it harder on myself by making a terrible mess! Note to self: don't fill the blender more than halfway if you are blending something hot, and hold the lid on TIGHT. Yeah, you can imagine what happened today in my kitchen. Even after starting with slightly fewer tomatoes than the recipe required, and adjusting the ingredients accordingly, I ended up with more than the recipe said I should get - 6.5 pints, rather than 6, when I should have had about 5.5. Not sure what happened there except maybe since I used the food mill instead of a wire strainer I got more liquid? I am a little worried that I made runny ketchup so I hope that it gets thicker when it cools. My husband thinks it looks like some sort of witch's potion. Especially when it was bubbling slowly on the stove. It does taste good and it was a good way to finish up my local honey which had crystallized and was no longer pourable. We were invited to our neighbor's house yesterday to break bread. This was no ordinary bread. He had been planting rye grass in his yard and then got to wondering what would happen if he let it grow and harvested it? 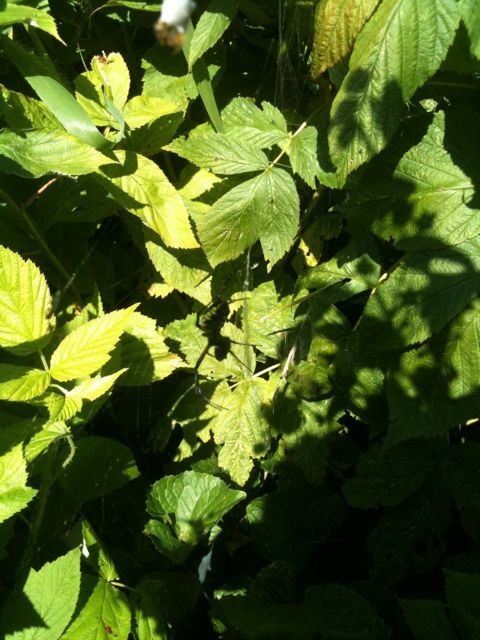 Well, he let the whole yard grow and then, recently, harvested it with a scythe. Then he threshed it. And winnowed it. And ground it. And made bread. It is (and was) a work of art! I can't even begin to tell you how good it is. In return, we brought some of the apricot ginger mulberry jam which not only tasted fabulous on the bread, the mulberry tree is across the street from his house. Talk about eating local!